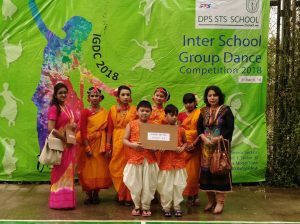 Our students participated in the Inter School Group Dance Competition organised by STS DPS, Dhaka. 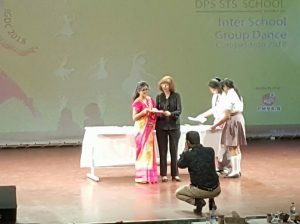 Students from different schools across Dhaka participated in this competition. The occasion was graced by esteemed guests and a panel of judges. 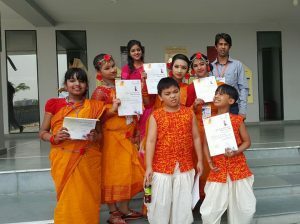 The competition was conducted in two groups for both categories for the sake of convenience and also for providing larger scope for the young vibrant dancers to display their skills. The children were awarded with certificates for their marvellous effort. Thanks to Ms Asma Abir for her great effort to prepare our students as an in-charge for this competition. Also, thanks to Ms Omme Habiba Palash for offering herself to cooperate our competitors. Our honorable Principal Ms Maria Santana was present in the audience row accompanied by other teachers to support and encourage our performers as it was a surprise presence for our students. Thanks to the parents for bringing smiles to our students for allowing and encouraging them to participate in the competition.